Here’s our next Catriona Shearer puzzle. 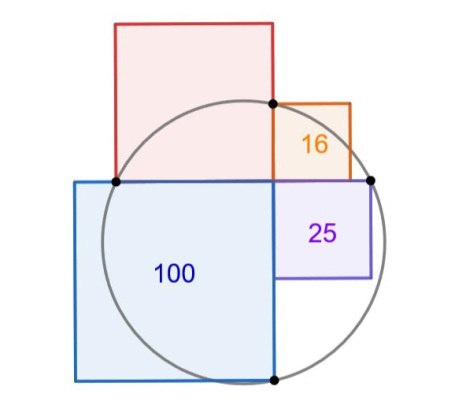 What’s the area of the circle? I never learned it either. Now I have. The perpendicular bisector of a chord contains the center of the circle, so the center is 6.5 left of the right end (or right of the left end) of the horizontal chord, or 1.5 left of the vertical chord; and the center is 7 below the top end (or above the bottom end) of the vertical chord, or 3 below the horizontal chord. Then we can draw a radius from the center to any of the chord end points. The square of the length of that radius we can calculate as , or as . Either way, , and the area of the circle is . May I politely note that at the very end you give the area as 51.5 pi when it should be 51.25 pi – a typo I assume because all was well until then!